I have an invaluable summer tip for you if you like me have abominable eyesight and rely heavily on contact lenses: get prescription sunglasses. You probably know they exist and have probably dabbled with the idea of getting them – but trust me, they’re really, really quite life changing and well worth investing in. I came to the decision to buy them earlier in the year as my eyesight is shocking, meaning I mostly rely on daily lenses, which frequently leave my eyes feeling a bit dry and in need of a spritz of some eye-lubricating spray (I worked with Optrex on a campaign and still use theirs – link to the piece here). This is only ever worse during summer months. If I wear my glasses, I end up squinting in the bright sunlight. On holiday, my only option used to be to wear lenses with sunnies on top. After a day on a hot beach with all that entails including potential sand in eyes and salt water getting onto lenses and contraband snoozes (my optician warns me against them while wearing lenses every single time I see him), I would usually have to peel the lenses out of my eyes come the evening. Now, I put my prescription sunglasses on as soon as I wake up and wear them throughout the day if on holiday or just on the dog walk and then switch to regular glasses if at home. When it comes to showering later in the day or going out, I just pop lenses in (and yes I do know you’re not meant to shower in lenses either but how on earth can you shave your legs or not slip and bang your head without the magic of proper vision?). There is one downside: if you go into a dark bar or restaurant and haven’t packed ordinary specs, people tend to stare a little. But it is a small price to pay for the comfortable, lubricated eyes that people who aren’t visually impaired get to enjoy without a second thought. I have two pairs. The first are the Ray-Ban Wayfarers that I took to my local optician and asked to have switched to prescription sunglasses. Most opticians will do this and choosing a classic frame like the Wayfarer is a good idea. It cost £200 as I am really quite blind and had to have the lenses made thinner with some fancy method so that the frames could accommodate them. I also got my hands on some Kylie for Specsavers ones in the Timebomb sun design as a press gift and like having a back up or switch if my nose gets tired from having those prongs rest on one spot for the entire day. 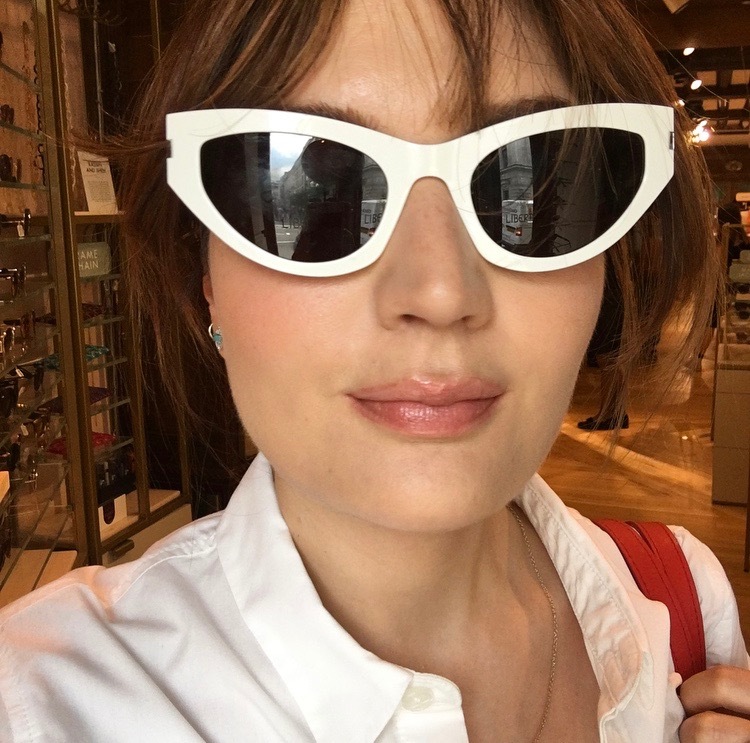 Also, while we’re talking about glasses, I’d like to mention that I bought the white Saint Laurent Kelly glasses pictured at the top earlier in the summer and am fully in love with them and everyone asks where they’re from. Apparently ASOS have done a very good knock off, but I don’t buy cheap sunglasses as I fear that in cutting corners my eyes might be exposed to more UV light etc and really don’t have much eyesight left to gamble with. I love your lip colour here. Is it a lipstick or a gloss?